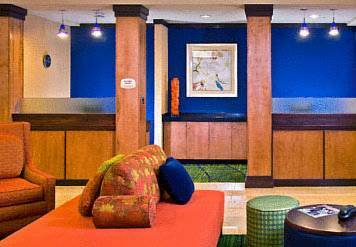 Treat yourself to contemporary accommodations and unparalleled convenience at the Fairfield Inn & Suites Lake City. We offer a range of excellent hotel amenities for your visit here in northern Florida. Step inside your spacious hotel room, which includes free Wi-Fi and a well-lit work area. Relax in front of your flat-screen TV, or prepare a snack using your microwave and mini-fridge. Marble bathrooms and plush beds add style and comfort to your Lake City, FL stay. Enjoy a free breakfast every morning, or swim a few laps in our heated indoor pool. Planning an event? Our hotel's flexible conference room can accommodate up to 65 guests. And we're just moments from great Lake City shopping and area attractions. Finally, with our hotel location near I-75, you can travel to Orlando and other Florida cities with ease. At the Fairfield Inn & Suites Lake City, youre our #1 priority. We promise you'll be satisfied, or we'll make it right. That's our commitment to you. Ask us about The Fairfield 100% Guarantee.